The following families have genealogy eBooks on this page: Forbes, Fussell, Gimm, Hickman, Lasher, Mihills-Moffatt, Moyer, Page, Pawling, Peters, Plumer, Rand, Sater, Tilley, Van Brunt, and Whitebread families. Welcome to Bookshelf 20 at Hawkeyes Trading Post! 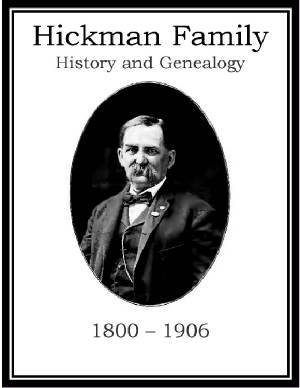 Forbes Family History and Genealogy. PDF eBook English 5.27 MB. 1819. 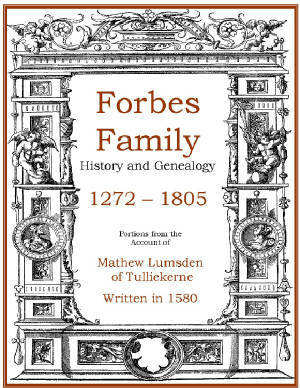 In this publication the Forbes family is documented as an ancient Scottish Clan of the Highland Country with kinship extending back to 1272, and lands having been appointed by the King. This extensive history provides names of ancient Forbes ancestors, and family lines, with many historical events. However, dates of the historical events are somewhat lacking, and must be researched elsewhere. Still, this resource is a valuable Forbes reference to the ancient Scottish Clans, and validates much in the way of Forbes family genealogy! Price $6.95 USD. Gimm Family History and Genealogy. PDF eBook English 2.31 MB 1909. 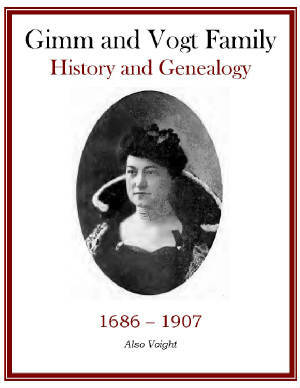 Spanning a period of 221 years, from 1686 to 1907, this eBook has excellent documentation for the families of Gimm and Vogt or Voigt. Although only 36 pages in length there is a detailed pedigree chart with excellent details regarding essential dates and names. Perhaps this is a unique source of Gimm family ancestry, and certainly a great resource for the family genealogist! Price $6.95 USD. Lasher Family History and Genealogy. PDF eBook English 10.5 MB 1904. The Lasher or Le Seur family may have adapted the name from the French La Chair according to family lore. Francis Lasher born in 1625 a French Huguenot fled from the storms in his own country to find quiet in ours according to tradition. 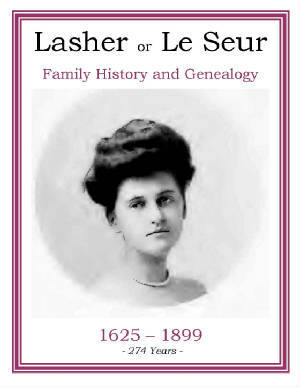 There are 15 rare ancestral photographs and an index of 24 pages containing over 1900 names of Lasher family ancestors and in-laws. A compelling resource for the Lasher genealogist! Price $6.95 USD. Moyer Family History and Genealogy. PDF eBook English 17.9 MB 1909. 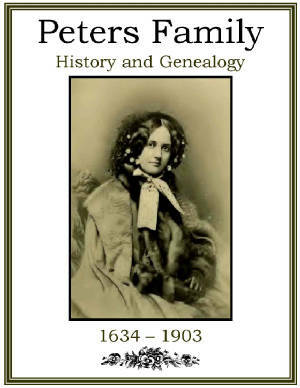 This publication of the Moyer family genealogy extends back 175 years, from 1734 up to 1909, in this wonderful addition to the family history. There are over 50 rare ancestral photographs with excellent detail of many in-law family genealogies. 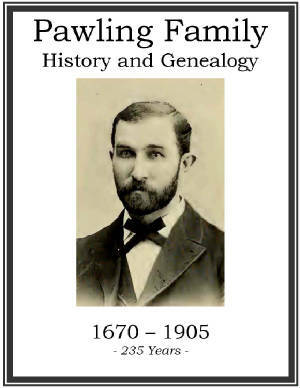 A great source for Moyer family genealogy! Price $6.95 USD. Pawling Family History and Genealogy. PDF eBook English 4.33 MB 1905. Covering a period of 235 years this publication provides many Last Will and Testaments that list people and merchandise. There are short biographies, with kinship ties to plantations and manor houses. Essential dates for descendants range from 1670 up to 1905. A great source of documentation for the Pawling genealogist! Price $6.95 USD. 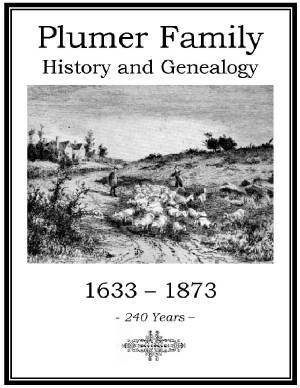 Plumer Family History and Genealogy. PDF eBook English 1.18 MB 1874. Francis Plumer and his wife Ruth came to New England in the American Colonies in 1633 and settled in Newbury in 1635. Essential dates for their descendants range from 1633 to 1873 covering a period of 240 years. 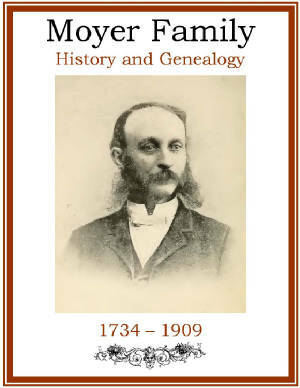 Although only 25 pages in length this publication may contain unique information regarding early Plumer family genealogy! Price $6.95 USD. 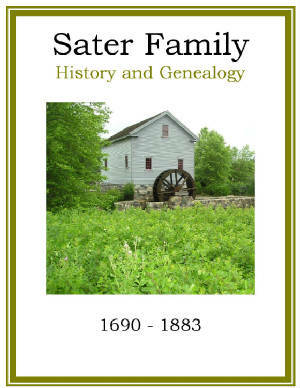 Sater Family History and Genealogy. PDF eBook English 12.2 MB 1897. This history was likely compiled on an old tall model Remington typewriter, and the ink is faded on the pages but still readable. Centered around Henry Slater, his Maryland tobacco plantation, and venerable Sater Baptist Church, essential dates for his descendants range from 1690 up to 1883. Tombstone inscriptions in the family cemetery and compelling words on the slave cemetery are described. A Sater family historian would do well to retype this historical account for future generations. This may be a very rare account of the family genealogy! Price $6.95 USD. 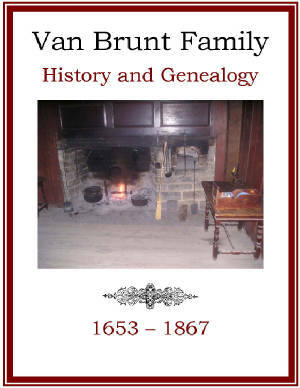 Van Brunt Family History and Genealogy. PDF eBook English 4.78 MB 1867. Rutger Joesten Van Brunt emigrated from the Netherlands to the American colonies in 1653, and was one of the first settlers in New Utricht. There are 5 generations compiled with essential names and dates ranging from 1653 to 1867. There are many Last Will and Testaments listed in this publication along with a 13 page index containing over 1300 descendants and in-laws. This is a great source of genealogical information for the Van Brunt family member! Price $6.95 USD. 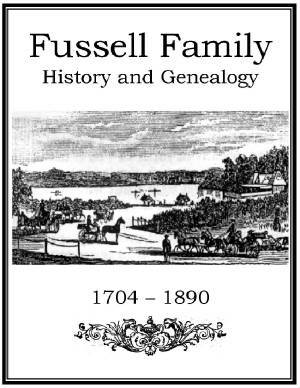 Fussell Family History and Genealogy. PDF eBook English 2.31 MB. 1890. This publication was originally compiled on a Remington manual typewriter in the year 1890, and has annotations by an unknown hand up to the year 1899. Evidently, the notations are from a Fussell family member from over a hundred years ago. Solomon Fussell, son of William and Elisabeth Fussell of Yorkshire, England emigrated to Pennsylvania in the American Colonies in the year 1721. There are 195 years of his descendants compiled in this rare publication! A real treasure for the Fussell family genealogist! Price $6.95 USD. Hickman Family History and Genealogy. PDF eBook English 4.59 MB 1904. Family groups are compiled starting with the Roger Hickman family. Roger married Mary Jenkins in 1800 and over the years they had 5 children. Essential dates with descendant names range from 1800 up to the year 1906. Details on the 1st Hickman Reunion on September 1st of 1897 are also described. 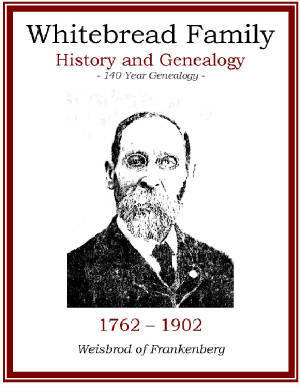 This is a wonderful addition for the Hickman family genealogist which provides hundreds of relations from over two centuries ago! Price $6.95 USD. 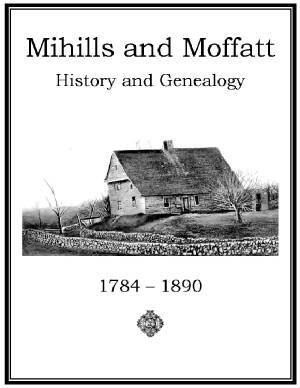 Mihills and Moffatt Families History and Genealogy. PDF eBook English 1.93 MB 1893. The family lore and legend of Scotland, Ireland, Vermont, New Hampshire, and New England are compiled in this 28 page publication from 1893. There are numerous letters from the 1800s, poetry, and reference to the picturesque town of Moffatt, Scotland that was settled about the year 1300. Essential dates range from 1784 up to the 1890. An excellent source of history for the family genealogist! Price $6.95 USD. Page Family History and Genealogy. PDF eBook English 4.89 MB 1911. This publication references various Page families from very ancient days, and their part in history covering a period of 650 years. It spans time from the year 1257 up to 1911 with a brief history and genealogy of the allied families of Nash and Peck. A great journey back in time for the Page family genealogist! Price $6.95 USD. Peters Family History and Genealogy. PDF eBook English 20.0 MB 1903. This publication is an extremely well written, well documented genealogy with many rare ancestral photographs, family member poetry, many Last Will and Testaments, hand written wills, and an extraordinary roster of Peters family members who were in the military service. Essential dates for descendants cover 269 years from 1634 to 1903. There is also an index of 24 pages containing over 2400 names! A great resource for the Peters genealogy! Price $6.95 USD. 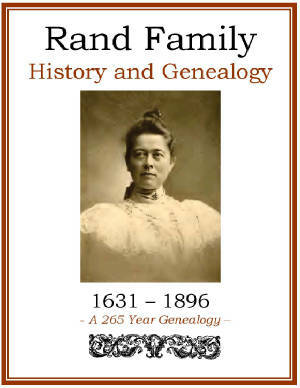 Rand Family History and Genealogy. PDF eBook English 13.2 MB 1898. There are over a dozen rare ancestral photographs with 8 generations of Rand descendants that spread across 265 years of history. Essential dates range from 1631 to 1896 with family legend that dates back to 1475 in Bedale and York England. A 26 page index contains over 3000 names of Rand ancestors and in-laws! This is most certainly a great reference for Rand genealogy! Price $6.95 USD. Tilley Family History and Genealogy. PDF eBook English 4.04 MB 1878. 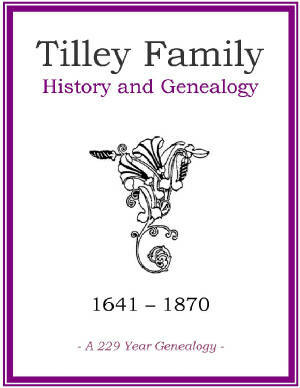 This publication explores the family legend that the Tilley name is supposed to be French going back to the 13th century. The essential dates, with names, and dates, range from 1641 to 1878 for the descendants of William Tilley who settled in Boston in 1660 and was a rope maker by trade. Descendants of his brother John Tilley, and mention of his cousin William Tilley who came to the American Colonies June 19th of 1635 aboard the Abigail are included. 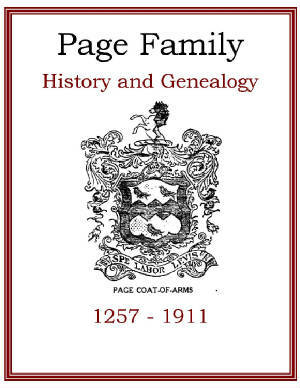 There is a 15 page index containing over 600 descendants and in-laws which span this remarkable 237 year family genealogy! A great reference! Price $6.95 USD. Whitebread Family History and Genealogy. PDF eBook English 2.92 MB 1902. Henry Weisbrod was born November 12, 1762 in Frankenberg, Germany. He spent 13 weeks crossing the Atlantic and arrived in the American Colonies on August 6th of 1784 just after the war. This is a very well written account of early Whitebread pioneers carving out their livelihoods in frontier America. It is all about their struggles and accomplishments learning new ways. Essential dates of descendants range from 1762 up to 1902. An excellent history of the Whitebread lineage for the family genealogist! Price $6.95 USD.